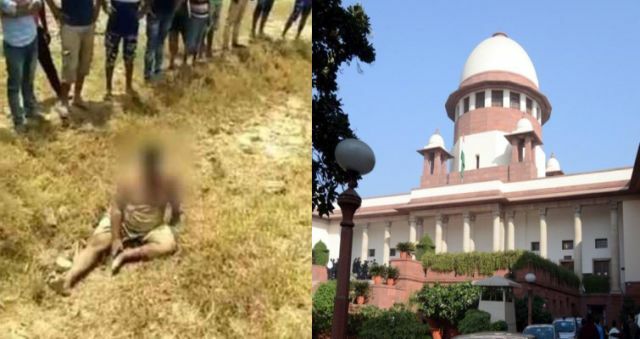 New Delhi : The Supreme Court on Wednesday directed the Inspector General of Police of Meerut zone in Uttar Pradesh to directly supervise the probe into the lynching of a Muslim man by a mob in Hapur. The officer will also act in accordance with the apex court’s earlier order pertaining to mob lynching, a bench of Chief Justice Dipak Misra, Justice A.M. Khanwilkar and Justice D.Y. Chandrachud said. The court was hearing a plea for a court-monitored Special Investigation Team probe into the lynching of Qasim, a cattle trader, in Bajhera village in Hapur district on June 18. “… investigation will be carried under the direct supervision of the Inspector General of Police of Meerut zone,” said the bench while posting the matter for hearing after two weeks. The Uttar Pradesh Police earlier told the bench that 10 of the 11 accused were arrested and that a new Station House Officer was probing the case under the supervision of the Superintendent of Police, who is the nodal officer. As the counsel for petitioner Samayuddin, who was also beaten up by the mob of cow vigilantes, insisted on the case’s transfer out of the state, the bench asked police how long it will take to complete the investigation. The police said it will be completed in 60 days. The petitioner had pleaded for the cancellation of bail to the accused, contending that the police had ignored the top court’s direction to curb lynching. On July 17, the Supreme Court had issued 22 guidelines to the central and state governments to put an end to the “horrendous acts” of vigilantism, lynching and mobocracy and directed them to work in tandem to take “preventive, remedial and punitive measures”. The top court had said that it was the duty of the State to “ensure that the machinery of law and order functions efficiently and effectively in maintaining peace so as to preserve our quintessentially secular ethos and pluralistic social fabric in a democratic set-up governed by the rule of law”. Of the 22 guidelines, 12 dealt with preventive steps, nine with remedial measures and one punitive action against police officers found wanting at any stage — prevention, investigation and expeditious trial. The departmental action “shall be taken to its logical conclusion preferably within six months”, the court had said. The court had also suggested that Parliament enact a law categorising lynching and other forms of vigilantism as a distinct offence and providing for adequate punishment.